Calling all cider lovers! 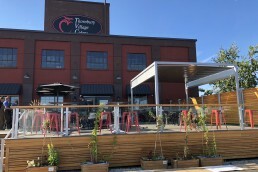 Since 2006, Thornbury Village Cider House has been located in the core of 7,500 acres of apple orchards. Using 100% Canadian apples, the brewery produces premium quality ciders available in-house or on the go. The Apple Pie Trail is a culinary journey through 30 local stops where cider enthusiasts and apple addicts follow a dotted map along Georgian Bay. Sipping and eating through areas such as Collingwood, Blue Mountain Village and Thornbury, it’s a road trip even your doctor will encourage. 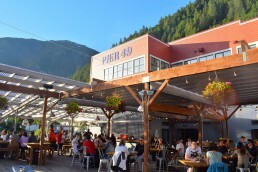 At stop number 29, thirsty travelers can enjoy a tasting flight of craft beer, cider or a variety of wines from Colio Estate Winery. 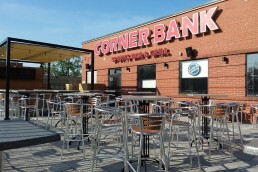 During the warmer months, patrons opt to raise their glasses on the large open patio. 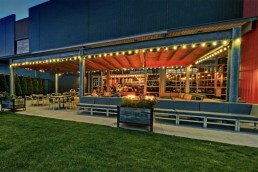 Continuously striving to enhance their ciders, the company also invested in boosting their consumer experience. 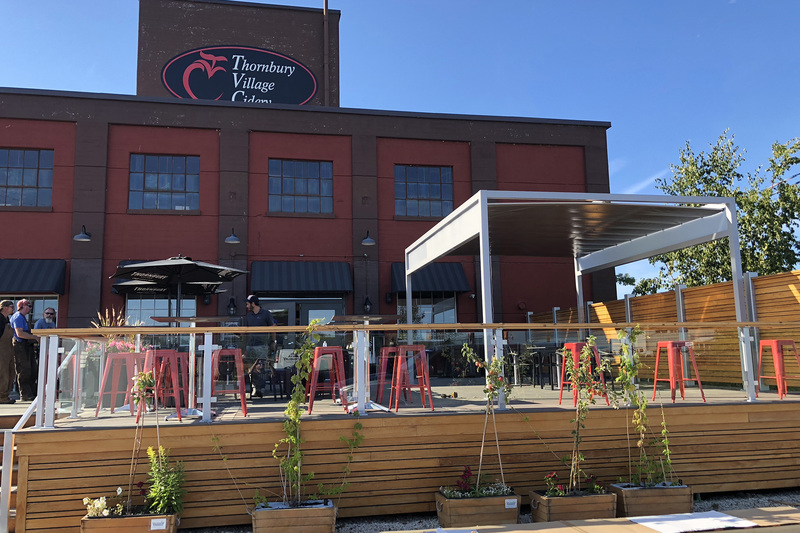 Thornbury Village decided to improve their patio season by adding extra sun and rain protection. 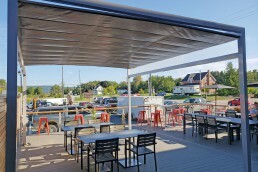 ShadeFX installed an aluminum pergola kit customized to the Cider Houses’ specifications. 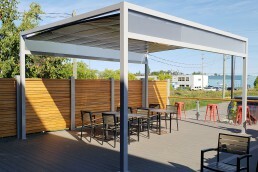 Complementing the current design of the patio, an 18’ x 14’ outdoor structure is powder coated Window Grey. The premium turnkey solution is topped off with an Arcade FR Taupe fabric allowing the users to control the motorized retractable canopy. On those drizzling days, the waterproof fabric paired with custom gutters allow consumers to stay dry while satisfying their thirst. 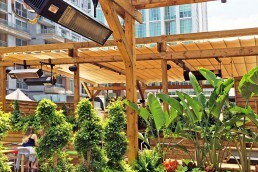 Want to improve your patio season? Let’s get started today. 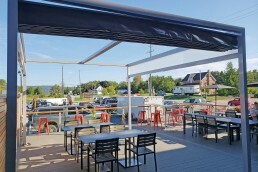 ShadeFX installed an 18’ x 14’ aluminum kit at Thornbury Village. 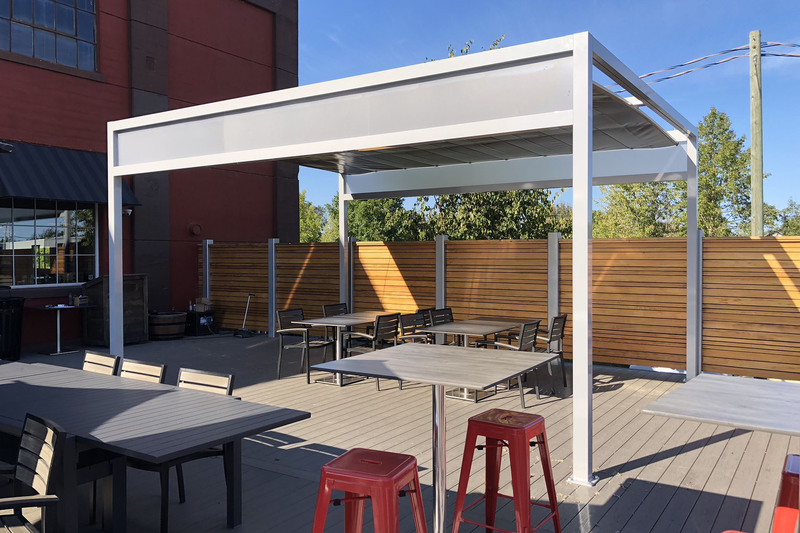 Paired with gutters and a waterproof motorized retractable canopy, consumers can stay dry while tasting their premium flight of craft beer and ciders.